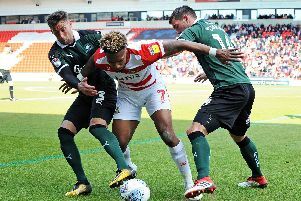 Will Longbottom has been urged to finish the season strongly and prove Darren Ferguson was right to reward him with a new contract. Versatile forward Longbottom was handed a new two-and-a-half year deal last month, reflecting Ferguson’s faith in his abilities. And as he prepares to send the 19-year-old out on loan, the Rovers boss says all eyes are on Longbottom to see if he is capable of breaking into the first team next season. “Certainly we’re looking to him to kick on now,” Ferguson told The Star. “He needs to have a strong finish to the season, probably go on loan to the Conference. “Will played on Tuesday in the development squad game and we’ll look to get him out on loan now. “He went to Kidderminster and did very well. These games will toughen them up. Ferguson says key to Longbottom’s development will be a good stretch of time without injuries. His season so far has been blighted by injuries, which have restricted him to just one appearance in the Checkatrade Trophy and being named among the substitutes a handful of times. Longbottom’s loan with Kidderminster earlier this season was ended by an ankle injury. “We just need to keep him fit,” Ferguson said. “He’s had far too many injuries for whatever reasons. “Perhaps it’s growth or his body is still developing and you can get that with someone of his age. “I like the lad. Good size, good physique. He can play in different positions, he’s got a left foot which can make a difference. He’s got a lot of good attributes the boy. “We need to get him back out on loan now. He played on Tuesday in the development game and we’ll look to get him out on loan. Already out on loan are young duo Reece Fielding and Tyler Walker who rejoined Biggleswade United, with whom they enjoyed a loan spell earlier in the season. And Danny Amos has joined Buxton on a youth loan for his first time spent away from the club. Ferguson said: “It’s a good experience for Danny. He played on Saturday and he had mud coming up to his knees so it’s a good experience.